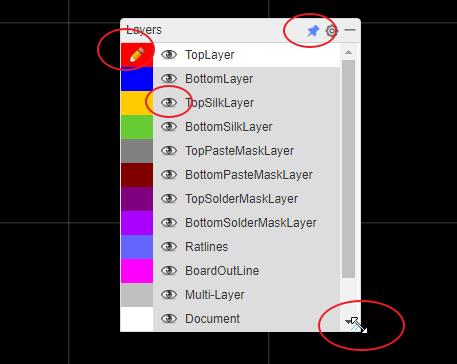 Active Layer: The colours of the layers in the Layers Tool are defined in the Layer Options Settings. To work on a layer then you must make it the Active layer. Click on the eye icons to show/hide layers. The pencil icon in the coloured rectangle indicates that this is the active layer. Click the pin icon to fix the layering tool without automatically closing it. The height and width of the layer tool can be adjusted when dragging the lower right corner of the Layers Tool.